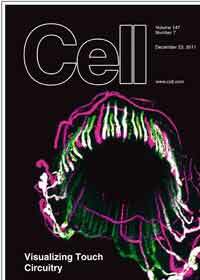 The journal Cell's cover story features research findings by University of Wyoming neurobiologist Jeff Woodbury. He was part of a research team that is providing a new understanding of the sense of touch. A research team including University of Wyoming neurobiologist Jeff Woodbury has discovered a new technique to determine how the touch sensory system is organized in hairy skin, providing a new understanding of the sense of touch. Their findings were selected to appear as the feature and cover article in Cell, one of the pre-eminent international journals in the biological sciences. The research provides the first picture of how nerve cells that carry signals from hair on the skin are organized. Unlike all other senses, the skin is least amenable to study and has remained the most poorly understood. "We have described the system that is in place to help explain how sensory information is processed to perceive the sense of touch," says Woodbury, an associate professor in the UW Department of Zoology and Physiology. He was part of a multidisciplinary research team led by David Ginty from Johns Hopkins University. Colleen Cassidy, a doctoral student in Woodbury's lab, was a co-author of the study, which also included colleagues from the Howard Hughes Medical Institute at Rockefeller University, University of Pennsylvania and University of Pittsburgh. "We have also been able to identify how combinations of nerve cells respond to fine-tactile stimuli, so we can now really begin to tease apart the circuitry of touch sensation," Woodbury adds. "One of the real breakthroughs is that, for the first time in more than 200 years of study, we now know the specific functions of some of the many different kinds of nerve endings in the skin. This is truly exciting and a major advance." Mice have several different types of hair follicles in their coat, each of which is linked to the central nervous system by low-threshold wire-like nerve cells that stretch all the way to the spinal cord. There, the myriad signals carried from the skin are integrated, processed and sent to the brain. This network of nerve endings in the skin of most hairy mammals, including humans, allows them to perceive fine tactile sensations, such as a drop of rain or an insect landing on their skin. The researchers now have a better understanding of how this complex system is organized. Before this discovery, Woodbury says there was no way to see how all of these different nerve cells were arranged -- both in the skin and at the top of the spinal cord, where they end up. The study, Woodbury says, opens doors to understanding not only touch, but skin senses such as temperature detection and pain. "Touch is ultimately felt in the brain; it alerts us that something is going on," he says. "We have identified the logic of how this system is organized. We now know that each individual hair is a distinct sensory organ, and each one will detect different forces. A broad spectrum of frequencies within a given stimulus are ultimately recombined and analyzed until we become aware that something has happened, like a drop of rain or a light breeze." Once the different sensory neurons are identified, researchers could test hypotheses about the role of these cells in the process of sensation. "For example, researchers could study the animal, in the presence or absence of each of the different types of sensory cells, to determine differences in the animal's behavior," Woodbury says. "It will be possible to shut them off, take them out of the picture, to see how the animal responds to different types of stimulation. The key to understanding any system is first to gain a marker to identify all the different components, and we have made a major step in that direction." Woodbury is among scientists in UW's Neuroscience Program, supported by a five-year, $5 million grant from the National Institutes of Health's Center for Biomedical Research Excellence. His earlier published work demonstrated how touch and pain sensations are carried to the central nervous system. One important discovery provides new insight into the way normal pain signals can be either reduced or amplified at different temperatures.